Oh my, where to start. Anyone can tell from reading the summary of this book that it is going to be heart-wrenching. I am lucky in that I can't personally relate to Cistaro's story, yet I was still deeply affected by this book. I can only imagine how someone who can relate to Cistaro's story would experience this. I enjoyed Cistaro's writing quite a bit and she wasn't afraid to go all in. I suspect it can be hard to articulate the feelings that Cistaro had to go through in her life and I applaud her for that. In fact, this book reminds me of another well-known memoir of a woman coming to terms with her mother's death and I think readers of that novel (you know what book I'm talking about!) may be interested in this book. I will admit, though, that I did have some problems with the pacing of this book I felt that Cistaro did a fabulous job of digging deep and explaining her feelings, but I also felt that most of this book was stuck in neutral. 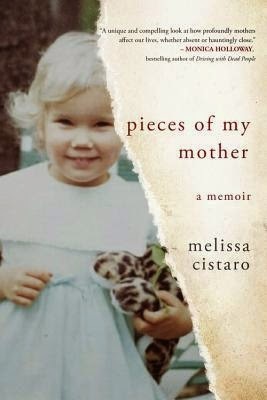 I never felt that Cistaro was getting closer to making peace with her feelings about her mother until, well, she had made peace. I wish that there had been more of a forward-motion in the narrative throughout the book. Would I recommend this book to others? Yes, although not universally. I don't think this is a book for just anyone and a reader needs to be in a certain "head space" for it. But, for some, this is an excellent memoir.